Foggy this morning, cleared off by noon . Few machines over in afternoon. Artillery quiet on the whole. Went round to Mess tonight, laughed until I cried at Joe. Good many machines over this morning. Pay day. Received books from Ma, letter and cigs from Gertie. Received letter from Dad. Day uneventful. Went round to the Mess tonight. Aerial wire breaks this morning. Big job to repair it. Received letter from Gertie. Artillery active this afternoon. Spent evening in billet. Fine day plenty of machines over. Artillery fairly active. Spent evening in billet. I heard that 32nd Division is moving. The 32nd Division was originally part of the Fifth New Army, and was numbered 39th. However, the Fourth New Army was broken up in April 1915, and the Division was renumbered 32nd, part of K4. It was formed of many units that had been raised by public subscription and private projects. It served on the Western Front with distinction throughout the war. Very quiet. Received letters from Miss Skinner and Nellie. Captain came, told us we are shifting (rotten). Had a bath. Day quiet, few machines over. Received letters from Miss Skinner and Syd Mould. Wrote some letters this evening. Captain came and told us to pack up but did not go. Received letter from Syd M.
Received letter from Gertie. New operator came, still at Martinsart. Roused up at 11 pm to go on duty, station dismantled e.g. nothing doing. French regain part of trenches lost at Frise, and repulse Germans at Vimy Ridge. Nobody came for us, all packed up. Germans repulsed south of Frise. Received parcels from Miss Search and Ma. Exciting time in Martinsart. Shells coming over fairly thick. A very large artillery gun, 8 inch Howitzers fired 200 lb (90.8kg) shells. Letters from Miss Search and Gertie. Nothing of importance. Heavy fighting round Frise: French lose ground. Moved to Dragons Wood, near the village of Suzanne , seven miles SE of Albert, where he stayed until 9th March. Left 165 Brigade, Royal Field Artillery to join 9th Siege Battery , Royal Garrison Artillery (RGA). 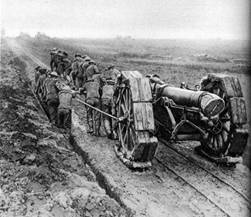 The Siege batteries had the largest guns and howitzers; mounted on railways or on massive fixed concrete emplacements and were consequently rather immobile. 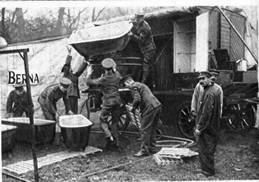 See http://www.1914-1918.net/rga.htm for details of the Siege Batteries of the RGA. Things fairly decent, some soldiering this. Dugout draughty as hell, going to alter this. Had supper in Officers Mess, some hut. 42�s come across, very near, plenty of noise, no damage. No machines up, rotten day. Rotten day. Germans surprise attack this evening repelled. Heavy firing about 6 pm . Went over Left section in the evening, no sooner got there than guns started, came away just in time, could see them dropping from side of hill. Went down to 2M this morning. Came back, found aerial down, shell caught it, plenty of shells over. Capt and Turner came. Rotten day, feet soaking wet. Letters from Maude, Ma and Chas. Day quiet, no machines over. Plenty of rain down - not unusual. Wonders, glorious day, good many machines over, two German machines over this afternoon No. 1 gun busy. Fine day, plenty of machines about, Germans as well, our beggars frightened of them. On 21st February 1916 the Germans attacked the French at Verdun - about 150 miles to the south east. The attack was massive and the battle continued until nearly the end of the year. The Germans had intended it to be overwhelming and hoped either for a breakthrough there or to inflict so many casualties on the French that their will to continue the War would be broken. In the end the breakthrough did not materialise, and, although severely tested, the French will did not break. Verdun developed into a battle of attrition, and, by December, each side had suffered about 350,000 casualties. Snowing nearly all day, found a bon aircraft fuse. Went down to see Williams this afternoon, beautiful Chateau they are in. Our pilot came over � could not make him see strips: e.g. CI. Turner came this evening. Finch got to open a station at Left Half; rotten. The "Popham panels" system was developed for ground to air signals. Cloth panels or strips laid out on the ground provided visual confirmation of radio signals from the aircraft. This system later became a common ground to air signalling system for front line units. Heavy fall of snow, up Left Half all morning putting up station, cold as hell, about fed up got a beautiful cold and cough and damp feet. Thaw set in rotten and damp underfoot. Got boots from repair shop. Receive letters from Gertie and Ma and parcel from Mo, tres bon. Luggie strafing round Suzzanne way. �Luggie� seems to be HTT�s slang word for the Germans, along with Bosche, Fritz and Hun. Definition: Strafing - to rake with fire at close range and especially with machine-gun fire from low-flying aircraft. Etymology: German �Gott strafe England � meaning �God punish England �, German propaganda slogan during World War I - 1915. Wound an inductance to try and get Nordaitch [?] NBG, get Paris much plainer. Should have been a shoot, weather unfavourable. Had an aeroplane shoot for a little while this morning. Capt Wylie made a muck of things, Capt Everidge called MF, and left section did the firing.